NEXT ENTERTAINMENT WORLD is in front of you! However, in the 21st century entertainment industry, we are used to speakers that have both with full frequency and an amazing subwoofer. Today, Jimmy G. presents the newly designed PKOP® W4 super full range speaker. The W4 has a simplistic design, however the frequency is not. Although it is a full range speaker, the low range can extend to 20Hz, which not only refers to the frequency, but also the transfer of an abundance of energy. When we walk into an nightclub with music playing, we get excited from the strong low-frequency shock, and high-energy, medium-high frequency the portrays from the speakers in which a stark contrast to the environment outside. If the machinery is not organized properly, and you stay in such an environment for a long time, you may experience dizziness and vomiting. How can this happen? Because phase differential exists between low frequency speakers and full frequency speakers in different places. The phase differential is not generated due to electronic signal passing the frequency divider. If we put an independent ultra-low frequency speaker and full frequency speaker in different places, the phase differential may still exist. This kind of phase differential may directly cause distortion to the music. Therefore, the balance of music is broken. So good music must combine both full frequency and low frequency. 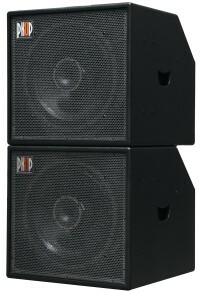 The W4 full frequency speaker consists of an 18 inch low-frequency driver and a 1 inch compression driver. Through a unique design, we can perfectly reproduce a full frequency signal with a low frequency reaching 20 Hz and high frequency reaching 20 kHz. The low frequency is especially energetic and dynamic, it can make the music have a feel of elasticity in the low frequency section. The wonderful design provides the human voice a feel of full penetrating power. You will not be able to find another speaker which can fully cover the powerful voice frequency of 20Hz-20 kHz only by 2 drivers, making it a really revolutionary innovation! The design can effectively overcome two types of phase distortions: the type caused by electronic frequency division and the type caused by separate placement of the subwoofer and full frequency box. Apart from the extraordinary tone and force, the W4 also has other strengths. As all speakers like this typically hang in place, it can save a large amount of space. This for more counters in the bar which is really beneficial to bar owners and club owners. Simplicity and conciseness are part of Jimmy G.’s original design philosophy. Any product which is only used for showing the engineer’s design ability while ignoring the consumer’s experience is desirable. The installation of the W4 is simple by easily hanging the W4 only by 4 matching rings. We can also make the W4 into a vertical linear array by matching iron fixtures. Since the speaker hangs in place we can easily reach a uniform sound field. Especially for low frequency, as there is no acoustic absorption of the seats and chairs on the floor and people, the whole efficiency of low frequency is greatly increased. It should be said, the quantity of speakers to reach the same low frequency force is half of other speakers. This will undoubtedly increase the confidence of investors—we can spend less money and achieve even better results.